Genelec releases GLM (Genelec Loudspeaker Manager) v2.0 for its SAM series monitors. 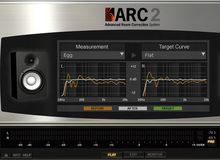 IK Multimedia updated its ARC acoustic correction software to version 2.1 in order to bring the AAX format on Mac and Windows. MathAudio announces the release of Room EQ, a standalone and VST equalizer software designed to replace the Auto EQ plug-in. For those who couldn't enjoy the Musikmesse Freeware last friday, BeyerDynamic officially launches its free Virtual Studio plug-in worldwide.